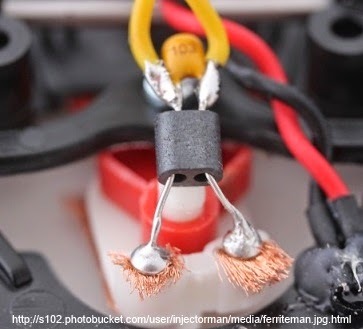 There is a lot written on forums about the ferrite man on slot cars to prevent interference that can affect the cars. There is also a lot written about the ferrite man being a common source of faults! Which I have found myself. The ferrite man is a capacitor and dual core ferrite bead. The capacitor being in parallel with the wires and the wires passing through the ferrite. I am no expert but the two provide different types of filtering. From my schoolboy understanding of electronics, the capacitor should smooth out voltage fluctuations or spikes and from my amateur radio experience the ferrite reduces higher frequency interference. The component is fitted in two locations in most slot cars and serves two purposes. The one at the motor is, in part, to comply with regulations to minimise interference in other electronic items and will have the benefit of reducing the overall interference within the track. The one at the guide is to prevent the track born interference from affecting the function of the digital chip. The motor end being essential however the more troublesome guide end is optional until you get a problem car or chip! It is not always as easy to fit when dealing with the tiny space available inside a slot car body. At the motor end, some manufacturers use different components, such as inline inductors (which look like resistors) however I have not had a difficulty fitting the ferrite man at the motor end. I am interested in what options there are to avoid complications with the function of the guide. Looking for alternatives I have been back to the basics. Using a number of twists round different size ferrite rings to filter out a range of frequencies is about the limit of my experience. There is some maths involved to work out the correct values of components. For slot cars I assume that this has already been worked out by someone more knowledgeable than I so sticking to the existing components is necessary. The components are a ceramic capacitor of either 0.01μF (marking 103) or 0.1μF (marking 104. Maplin part BX03D.) Either of those are easy to get from any electronic supplier. I found the dual core ferrite bead of that small size hard to find except as a spare part from Scalextric part number W8424. I also found a UK supplier of complete ferrite men. All very low cost but the carriage was always much higher than the component cost! The one area that can be varied is that the ferrite bead does not have to be on the bare leads of the capacitor. It could be a separate bead of a similar size just slipped on to the insulated wires. The capacitor, however, is still desirable so I am not sure how often that knowledge will be of benefit. The end result of this research has been that the ferrite man construction with the wires soldered to the capacitor end of the capacitor legs and the guide braids at the other end of the legs is the neatest solution I can find. My conclusion is that if there is space in the car and it does not interfere with the movement of the guide then it should be fitted.